Newsletters are published four times a year, generally in March, June, September, and December. 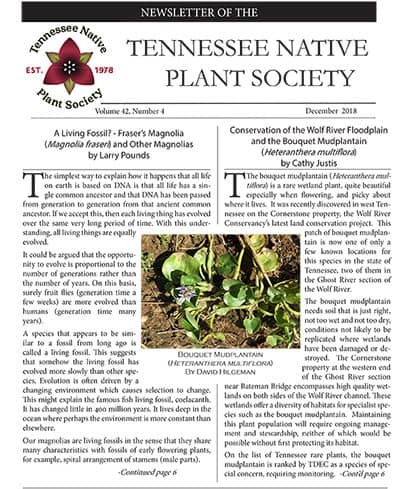 We welcome material from our members concerning Tennessee native plants. An archive of our older newsletters is available at the Biodiversity Heritage Library ⤤. David Hilgeman serves as Newsletter Editor. To send comments or submit an article, email newsletter@tnps.org. Members may receive either an email or print version of the newsletter. An advantage of subscribing to the online version of the newsletter is that the photos are in color, whereas they are black and white in the print version.